At the Intersection of Main & Church Street in Thurmont, Maryland, a few hundred Ethiopians gathered from around the country and the world. Six miles from the GB summit at Camp David, the entrance to the heart of the downtown area was blocked from vehicle entry by local police. The intersection where protestors had gathered was controlled by various police officers and a couple of dozen riot police in full gear. The protest rally was being attended by a few dozen other people who lined the sidewalks, some were gathered to observe the protestors, others were there as protestors and occupiers from the region, carrying signs for their own political causes and standing in solidarity. 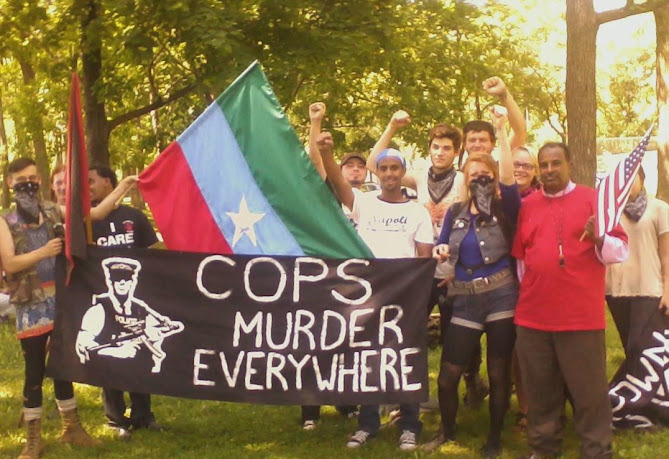 Ethiopians organized collectively to protest Prime Minister Zenawi's attendance at the G8 summit. Zenawi has ruled in Ethiopia since 1991, and is on lists at Amnesty International, Human Rights Watch, and Genocide Watch, for possible crimes against humanity and human rights abuses. Day 4 of the G20 and rebellions. The Indigenous Sovereignty March was the biggest one yet, with over a thousand peeps braving the nasty Toronto heat to show solidarity with Native folks. It was inspiring to see so many settlers coming out to support this action. Day three of subMedia.TV&apos;s G20 Rebellion coverage. Today we bring you updates on the Canadian Police State and we follow the Toxic Tour of Toronto.